With the lights dimmed a hush descended at Day Spring Church Castle hill (Aug 18). The ensemble goes into drive mode and the tone for the night is set with “The Greatest Showman”. For the next two hours, The De Lanerolle Brothers along with Rushan Hewawasam and the ConChord Choir treated Sydney residents to an array of musical delights. This was a first for Sydney and a brief background is warranted. Launched as a duo-act in 2009, The De Lanerolle Brothers’ career sky rocketed with a series of local and international appearances. They have shared the stage with Aaron Neville and The Branford Marsalis Quartet in New Orleans and performed alongside Olivia Newton John and The Bellamy Brothers. They have sung at Carnegie Hall and for internationally renowned musical director Battista Pradal. Back home they have regular sell-out shows at Water’s Edge and The Hilton Grand Ballroom to name just two, and despite their gruelling music commitments also run a successful Tea business. Rushan Hewawasam and the ConChord Choir are well known in Melbourne and it was a treat to have them visit Sydney. Comprised mostly of semi-professional musicians the choir was formed to serve the two-pronged purpose of creating great music and promote peace and reconciliation within the community. Rushan’s laid-back style and sense of humor at engaging the audience was very refreshing. singers invited the crowd to join in the popular songs, Spanish Eyes and Sweet Caroline. Even those who were tone deaf felt six feet tall and full of gusto after the song, “When the saints go marching in”. Commanding the stage with his rendition of “Old Man River” Ishan clearly demonstrated his musical ‘depth’ literally, hitting that lower ‘D’ on the scale perfectly. Made famous to us Lankans who grew up in the 70s by Lylie Godrige, this song also reminded the writer of another sonorous bass singer Mahen Peiris (R.I.P) and no doubt fondly remembered by the Brothers too during their days with The Revelation Gospel Singers. During various stages of the performance, instrumental accompaniment was injected to create that live symphonic feel. There was even an adorable kid’s choir segment and Prince fans were blown away by the music arrangement of “Purple Rain”. 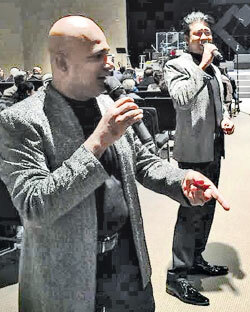 Rushan’s versatility was evident by his powerful singing voice and gentle touch on the keyboard as well. Being reminded of a past era and perhaps hankering for days gone-by, many in the audience could not resist when the ensemble sang the Tamil song “Chinna Chinna Aasai” followed by the heart-rending Sinhalese version of “Master Sir”. The night’s performance was bolstered thanks to the very talented pianist Lorna Ogilvie who glided over the ivories effortlessly. As a mark of mutual respect the choir dedicated “Wind beneath my wings” to the Brothers. Somewhere amid this musical array of fine singing, a quick 20 minute break was observed in typical Sri Lankan fashion to sample short-eats, and Kothu packets. Partnering with the STC OBA who sponsored this night was Siva of Blue Elephant Catering. The grand finale came in the form of a musical piece of ingenuity – symbolising ‘who we are and where we came from’ the ensemble raised the rafters with a brilliant fusion of Waltzing Matilda and Namore Namore Matha.